Well, it's that time of the year again. It's cold outside with wind blowing and rain/snow falling. Personally I love to have my fireplace lit and snuggle against a nice cashmere throw while reading on my ipad. With so many throw choices on the market with varying quality, it's often hard to decide what to buy; one of the brand you should consider is Rani Arabella. This company was founded in 1999 in New York but it produces its products in Italy. The result is a combination of a modern loft sensibility with Italian craftsmanship. A winning combo in my book for sure. I love the graphic nature of the pillows it produces every year. They are always whimsical and sophisticated. While the company produces various combination of fabrics, be it cotton, linen, wool, or my favorite is and always will be cashmere. They also produce many cashmere throws with fantastic patterns; some of them very traditional like cable knit while others are more graphic like chevrons or stripes. Either way you lean, I assure you that once you have Rani Arabella cashmere throw on you, it will be very hard for you to snuggle under any other throws in your home. 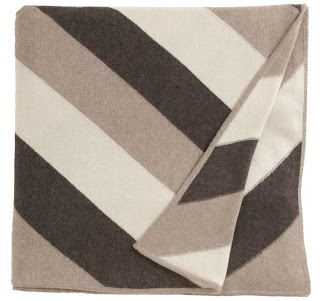 Rani Arabella throw can be found for sale at Barney's New York. But for some of us who are more budget conscious, you can also find them at One Kings Lane (between today and Saturday).